But the scandals seem inexorable. Last night, appearing at a dinner sponsored by the New Jersey Chamber of Commerce on its annual “Walk to Washington“—actually, participants ride Amtrak from Newark—Governor Christie used the occasion to issue a blistering, traditional Republican critique promising major new cuts in state spending, pensions and healthcare benefits, and more. While it appealed most of his audience, which included the cream of the New Jersey business community, it was also calculated to underscore Christie’s appeal to GOP voters around the country, part of Christie’s gradual effort to kickstart a presidential campaign stalled by the scandals that have plagued him since last fall. Last night, introduced by New Jersey Chamber of Commerce President & CEO, Tom Bracken—who didn’t mention the scandals except to refer to unnamed “distractions”—and by James Fakult, president of Jersey Central Power & Light, Christie didn’t say a word about Bridgegate, the conflict-of-interest scandal that brought down David Samson, the Christie-appointed chairman of the Port Authority, or the controversy over the misuse of Superstorm Sandy aid since 2012. But speaking just blocks from the White House, where he hopes to reside in 2017, he did warn that, in the next year or so, he’ll be pushing for tough new austerity measures and holding the line against taxes. Bizarrely, Christie was named “Father of the Year” yesterday, and he was a stern, disciplinary father indeed, saying, “It’s time to dig in and make a few people unhappy so the greater good can be achieved.” And those “few people” are teachers, public employees and disadvantaged New Jerseyans. Still, last night Christie was playing to national Republicans, touting his record as an austerity-minded, anti-union Republican in a deep-blue state. New Jersey, he said, is facing two paths: on the first, “once again, [to] increase taxes, not do anything about spending and once again burden the businesses of the state.” On the other, more pain for people who depend on state pensions and other benefits. He cited his controversial success in imposing a 2 percent cap on annual rises in property taxes statewide, which has severely undercut the ability of towns, cities and counties to spend any money, and he demanded that the New Jersey state assembly enact yet another arbitration cap on state salaries for public-sector workers. Either that, he said, or they’d face “broad layoffs.” Bombastically, he warned that the state is spending more money on healthcare for retired workers—people who, Christie said, “are doing nothing”—than it does on healthcare for current employees. To continue doing that he said, will turn New Jersey into Detroit. 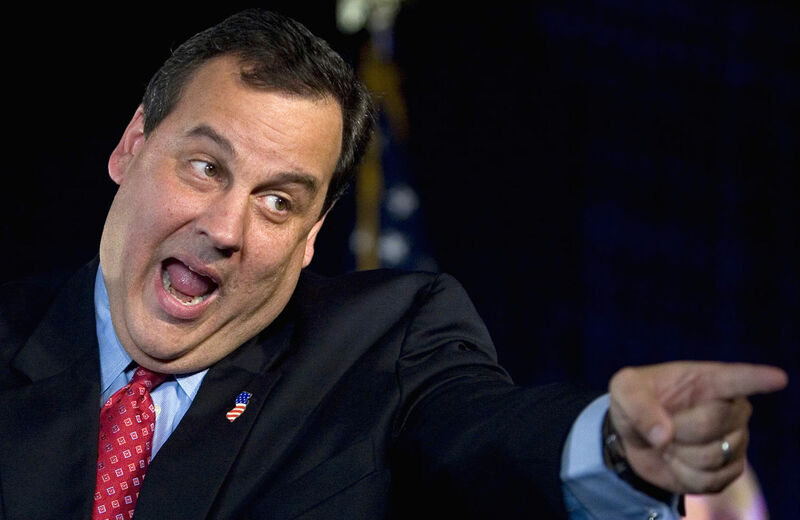 Courage, said Christie, “means looking people in the eye and telling them that they’re getting less.” And all of this, he reminded his audience, will be “an example for our entire country.” Clearly, Christie hopes that GOP primary voters in Iowa, New Hampshire and South Carolina are paying attention. But the scandals aren’t going away, to say the least. Yesterday, the state legislative committee investigating Bridgegate said that it will issue subpoenas for four key players in the events surrounding the lane-closings, including the executive director of the Port Authority, Patrick Foye, who blew the whistle on Bridgegate early on. Others being called are Christina Genovese Renna, who served as Christie’s director of intergovernmental affairs; Michael Drewniak, his spokesman, who apparently learned of the lane-closings last fall from David Wildstein, the orchestrator of the closings; and a Port Authority commissioner, William Schuber. Among the attendees at last night’s dinner was John Wisniewski, the New Jersey assemblyman who co-chairs the investigation, along with State Senator Loretta Weinberg. Schuber, a little-known player in the scandal so far, could be an important witness. He was subpoenaed by Wisniewski and Weinberg in February for documents related to Bridgegate. What’s interesting about the subpoena, besides the fact that he was one of a few PA people subpoenaed, is that they asked for records from September 1, 2012, to today that have any information about lane closures of September 2013. That would imply they wonder if he was part of the planning for it. Schuber, who served as Bergen County executive for twelve years, got a letter from Weinberg on September 19, 2013, asking him to look into why the lane closures occurred. Since he was a former top official of Bergen County and a PA commissioner she said she expected him to be interested in how the lane closure hurt Bergen County, adding that he would be expected to want to prevent it from happening again. But she didn’t hear anything from him. He is reportedly a friend of both Christie and of Bill Palatucci, Christie’s long-time top political aide, who sat on the dais last night with the governor.